“We love to perform. We are always happy to spend time with people and share our culture, even if it means we will be cold, or miss a few meals. A lot of us are older, and it can be difficult, but we love what we do so we stay ready.” Natalya Nikolaevna of Ayanga. Warm melody for a winters day. The first time I chanced upon Ayanga was brilliant February day. While the sun was beaming, it was not warm, so our hardy singers were bundled against the cold. Oh! How their Buryat carol hung in the chill, thawing heart if not toes. Colorfully furbished warblers gathered about a crackling fire to sing, make Salamat (fried sour cream, yumm!) and wish every soul present a Happy Sagaalgan. 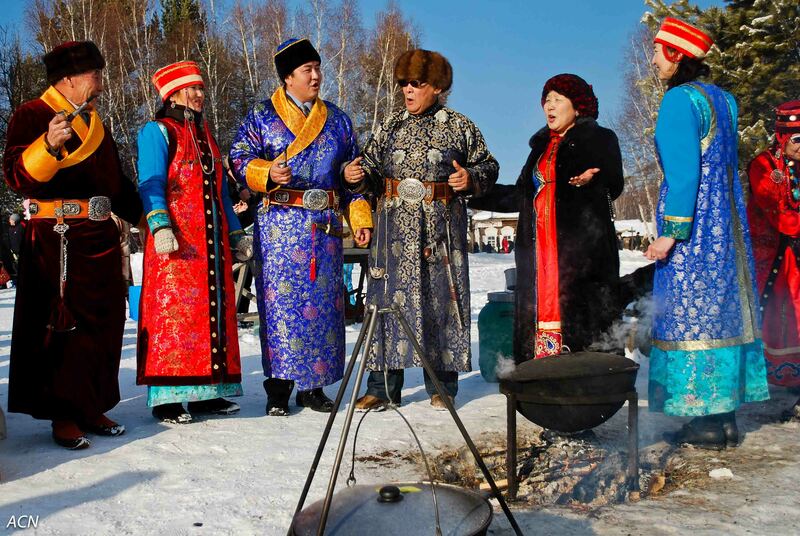 Sagaalgan, which means “White Month”, is the main holiday of the Buryat people, and the first month of the lunar calendar, that is the New Year. Another song while we wait for the sour cream to fry up in the kettle. One of the singers invited me to attend a rehearsal, where I watched Ayanga’s (Ayanga means Melody in Buryat) preparations for the climax of Sagaalgan; the public concert at the end of White Month here in Irkutsk. I sat and chatted with them, laughing at their humorous view on life, and wondering at the fascinating tales they wove. 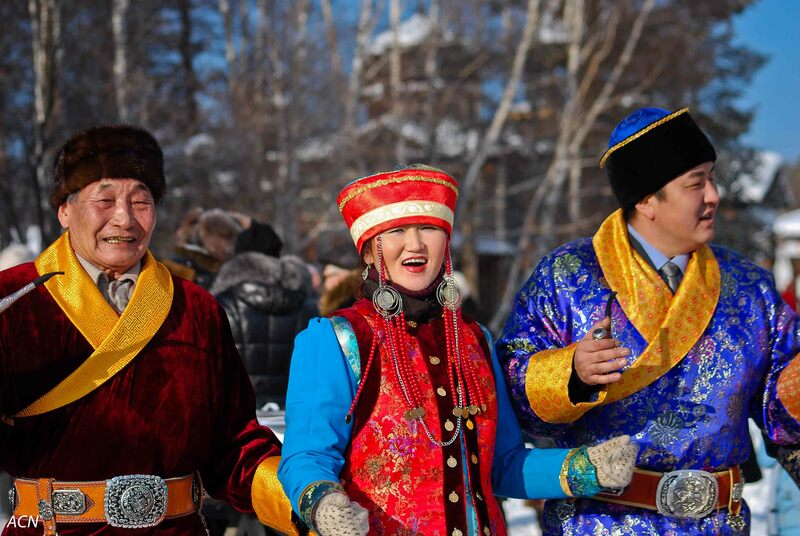 Buryats laugh, and it is easy to laugh with them. Last week I was able to sit down with Natalya Nikolaevna to hear about the history and development of Ayanga. 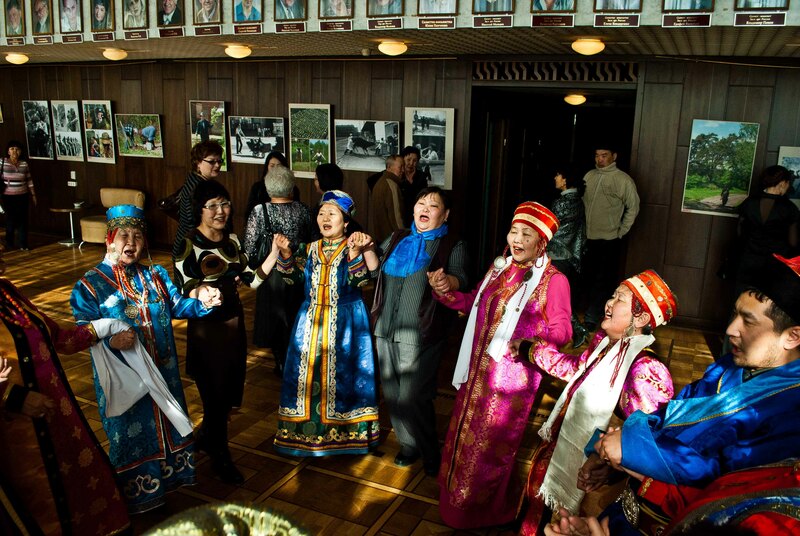 Buryat culture has made a real resurgence here in Irkutsk. In the last decade many Buryats have moved into our city from the countryside. 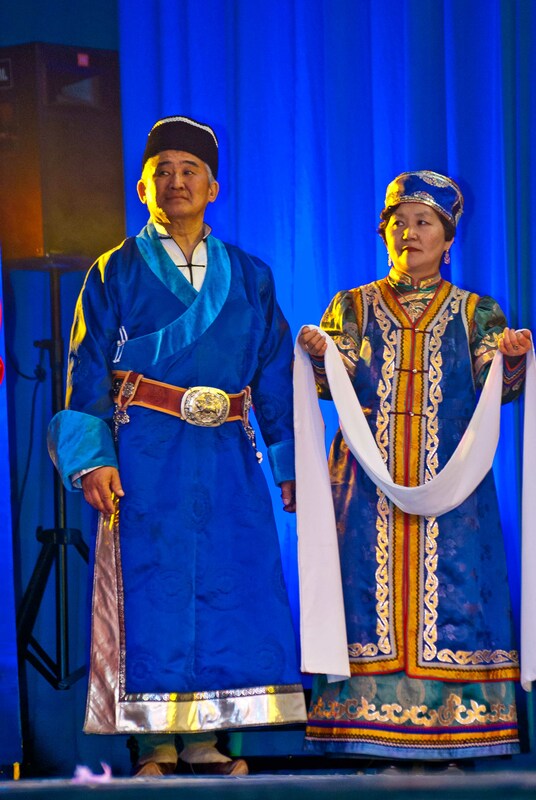 At the onset of this wave of migration, Natalya Nikolaevna and four other Buryats in October of 1998 came together to form the nexus of what was to become Ayanga. 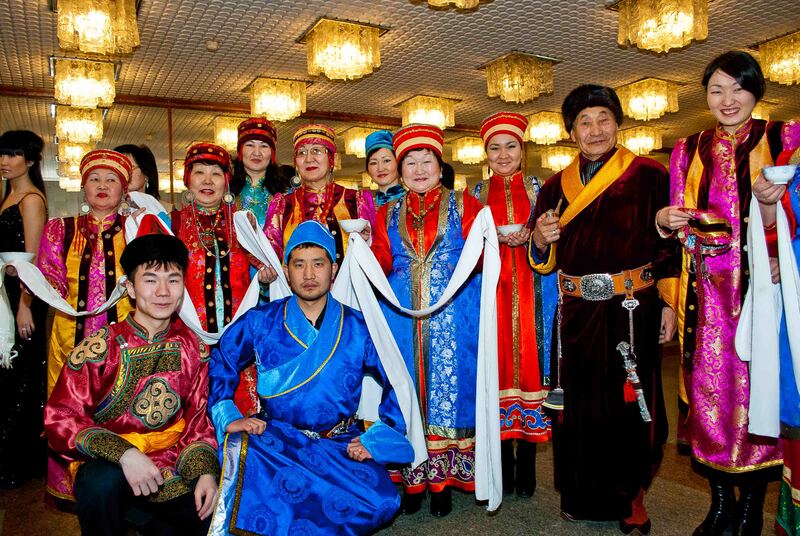 Their idea: To save and teach Buryat language, dance, song and culture so that it doesn’t disappear. “Ten years ago, we didn’t know our culture very well. We weren’t prepared to present it in capably,” said Natalya. 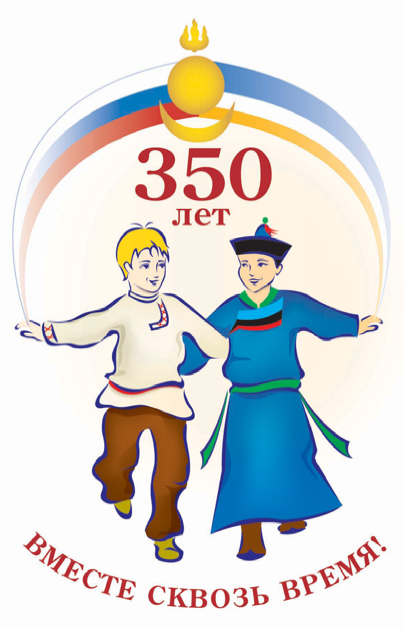 In the ensuing years they found other Buryats who had a living knowledge of their traditions, and with their help learned the proper techniques for voice inflection in song and authentic yohors (Buryat circle dances) instead of those developed for the stage. 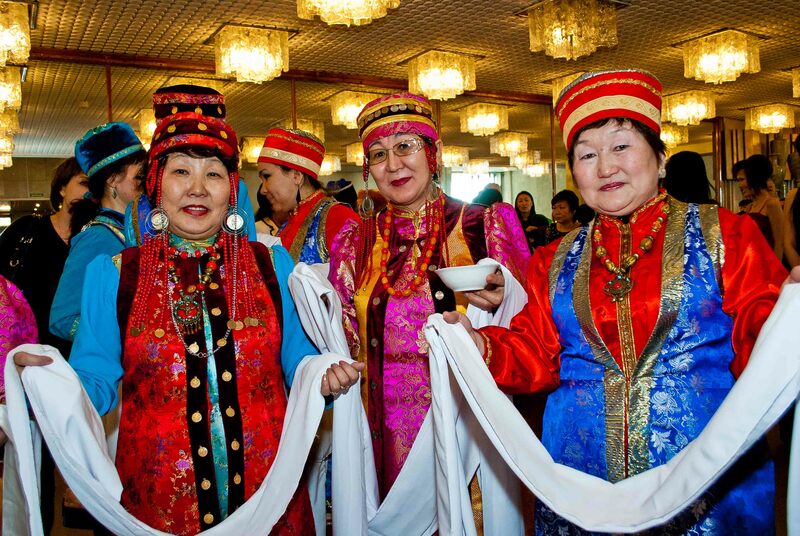 It is traditional for Buryats to greet guests with mare's milk in bowls and silk of white or blue. A deep bow of respect to you ladies! Intermission Yohor instruction for the audience. 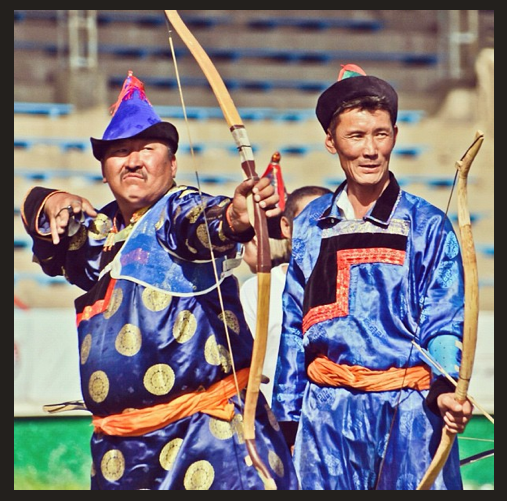 Most any festival in the Irkutsk Province, Buryat or Russian, will boast a performance by Ayanga. With twenty-four members, including a number of young people, they have garnered awards for representing their culture. Third place in 2006 and 2008 at Altargana, Biannual International Buryat Festival and second place at Altargana 2010. “Next year we will be shooting for first place!” smiles Natalya. We’ll be keeping our eyes on you Ayanga. Picasso, I dedicate this picture to you and your Blue Period. On stage at the Sagaalgan 2011 concert in Irkutsk. 350 years: "Together through time!" Stealing through crystal arches, you blunder right into the middle of Wild Kingdom! (Shout out to Marlin Perkins, who showed me the world from my television window.) The animals of the lunar calendar, stand paw to paw in ice. Rabbit is standing in the center, for it is his year to reign the cycle. I first came to Siberia in 1998, and in December of that year rabbits showed up everywhere in the city! On plastic shopping bags, little figurines for sale, framed pictures, on notebook covers, and stuffed animals. 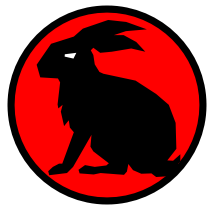 I remember asking someone, “Why are there rabbits everywhere?” Answer: Chinese lunar calendar. After animal kingdom, two stories of ice samovar, crowned with a teapot, and accompanied by four faithful courtier tea cups sparkle in the sun. No matter what people say about vodka, tea is Czar in Russia. You can easily go a day without vodka, but a day without tea is like forgetting how to breathe, it just doesn’t happen. 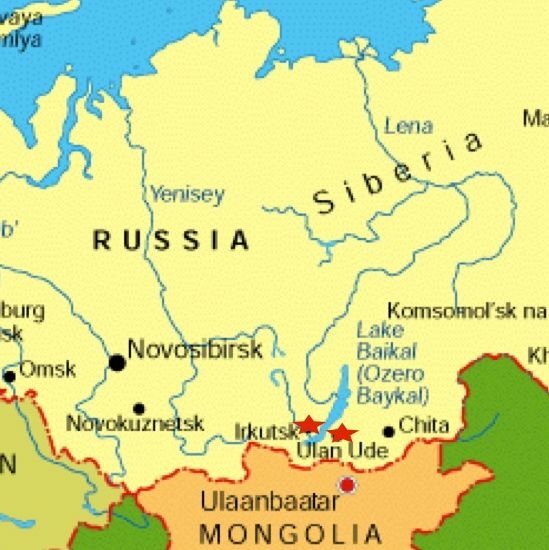 The tea road originated in China, passed through Mongolia and on through Buryatia, the Irkutsk Oblast (territory), and west toward to Moscow. Fortunes were made, cities built, intrigues played and perils risked on dried bales of tea leaves. Tomorrow the square will be filled with fur garbed New Year’s revelers, sliding on the ice-slides, merrily strolling together with family, greeting friends, and at midnight setting the sky ablaze with a veritable arsenal of Chinese fireworks. Happy New Year! С новым годом! 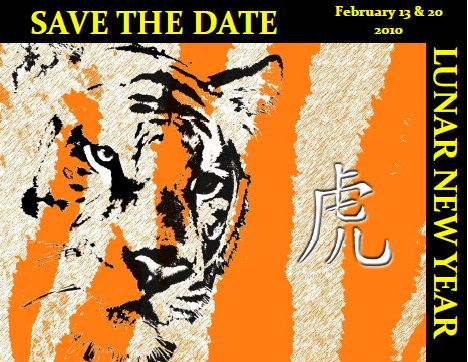 Leaving the year of the Tiger for . . .
the year of the Rabbit.